Once upon a time, search engines were robotic, mechanical, and mathematical. However, Google’s algorithm standards have since become much more focused on what those searching for information really want. As such, user intent is the key to creating the content that enhances the relevance of your pages and improves your SEO. 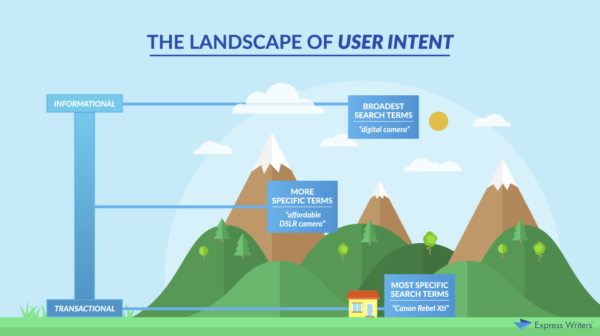 Neil Patel describes “user intent” as the goal someone has in mind when typing a query into Google. In some cases, the intent is to purchase something. For others, it’s to find information or make a connection with a company or an individual. Just as you wouldn’t develop a product without knowing who the user for that product is going to be, you shouldn’t develop online content without knowing how it can help people and whose goals it will help fulfill. What’s more, you’ll enjoy the added benefit of standing out as a brand that cares deeply about its customers and their needs. As you seek to better incorporate user intent into your content marketing strategy, these three tips can help. Transactional: A person wants to buy something. Navigational: A person seeks for a specific resource, page, or site. Informational: A person wants additional information on a topic or answers to their questions. Tailoring content for one of these types is critical. How do you do this? It’s simple. First, you look at keywords people are using in their queries. Some keywords are a dead giveaway for a particular type of user intent. For example, if someone types “buy fleece jacket” into Google, you could be pretty sure that the intent is transactional. If, someone queries “how do you change the lens in Smith goggles,” the intent is probably informational. If you’re not sure what users intend to do with the information provided based on their keywords, type the query into Google and evaluate what comes up. If most of the top results are transactional, you can bet that the user’s intent is transactional. Keep in mind that some queries have multiple layers of user intent, and you may need to tailor your content accordingly. To determine where your content fails to fulfill your readers’ needs, take a look at your top-performing keywords in Google Analytics. For example, if your top keyword phrase, “buy fleece jackets” (transactional), leads to an informational page about how fleece jackets are made, your readers will not reach their goal site. Consider redirecting your strategy so that this keyword phrase directs readers to a page where they can buy a jacket. If your content is doing what you want it to do but not being seen by searchers, your keywords might be your biggest issue. In these cases, you can overhaul your performance by changing your keywords to align better with your content. If you’re selling something, your keywords should be transactional. If you’re helping people learn about something, they should be navigational or informational. One of the best ways to improve the way your content caters to user intent is to walk in your readers’ shoes. View your site and ask as a reader: Does it do what I need it to do? Is it helpful and engaging? Does it help me fulfill my goals and answer my questions? Does the site load fast enough? Today, 47% of customers expect a page to load in less than 2 seconds. If your site takes longer, you risk losing critical traffic. Now is the time to take steps to decrease your load time. Is it easy to navigate? Navigation is key to a successful site experience. Make sure your menu bars and page navigation support this goal. Is your website responsive? Mobile users should have as positive an experience viewing your site as your desktop users. To help your content cater to your audience, implement responsive design throughout your site. 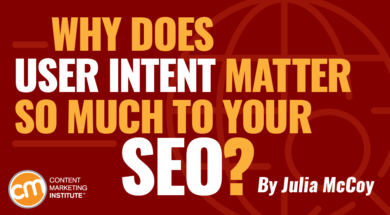 While it’s still not possible to beam yourself into your readers’ minds to know exactly what they’re thinking at any given moment (Google is probably working on this), it is possible to use the pillars of user intent to shift your content to help your readers fulfill their goals more efficiently. When you know why your readers are using a search engine and what they’re hoping to find in the content they come across, you can make your online material more relevant and helpful than it’s ever been. This, in turn, makes it easier for search engines to recognize your content as valued by your readers, and boost your rankings to help the next person searching with a similar intent. Do you want to expand your content marketing skills? Complete this transaction – subscribe to CMI’s free daily or weekly digest newsletters – to satisfy your informational intent.